People often ask me how I engage people so readily in conversation over the telephone. The first question is easy to answer. I always say I’m Ellen Naylor. The second question is harder to answer without more context. 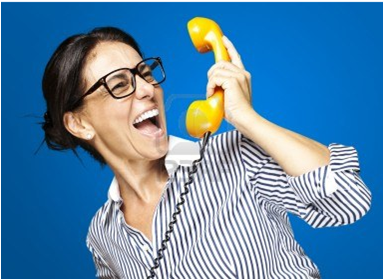 Is it a cold call or a warm call? A cold call is when you don’t know the person and they don’t know you. A warm call is when the other person doesn’t know you, but you know them through your sources. Or it might be a hot call which is the easiest: you and the person you’re calling both know each other and why you’re calling. You have different preparation for each type of call. But you need to have a good entrée to each person so they know in short order why you’re calling, what you want and what’s in it for them to give you their time for an interview. With all calls, you want to give the person a good reason to talk with you, and not waste their time with small talk and listen very closely to how and what they share and don’t share with you. With a cold call, I research the person’s profession and try to find out what about that profession I can relate to or not, and get the conversation going. After a few interviews you get even more ideas about what they do and don’t tend to like about their job. In a healthcare query each person I spoke to was a recruiter for medical professionals who traveled to different hospitals around the US for work. I got their attention by mentioning that it must be challenging for their employees to be away from their families. With others, I mentioned how much I liked to travel. This simple entrée got most of them talking. Using elicitation techniques, another great entrée for me is, “I’m Ellen Naylor and I wonder if you can help me.” Then I tell them why. People often can’t resist the urge to be helpful in our US culture, especially when talking to a female who sounds young. If someone is a little hesitant and less interactive, I often ask if this is a bad time, and will call them back later. Other times this hesitation means they expect me to share something in return before they’ll start talking. So I will share some tidbits I have learned, and these can be my best interviews. In a recent project, I called one of these hesitant guys back at 6:30 a.m. his time. We conversed for about 45 minutes, and I felt like I had a new friend by the end. Warmed up calls are so much easier since you don’t have to quickly convince a stranger that you’re worth talking to. However, you do need to respect their time and be polite. One way is to hone in on relevant information about them so you can ask better and tighter questions. The bottom line is I consider who I am talking to and the questions I need to have answered. I try to think of all the ways the person might answer them, so I am more prepared for the unexpected. Calls seldom go as planned whether they’re cold, warm or hot. You are dealing with another human being. Be flexible and prepare additional questions for the unexpected turns of an interview. Don’t take yourself too seriously and keep that smile on your face. Good stuff from Ellen Naylor again! Nice succint examples of how to go about primary intelligence gathering and getting people to talk. Also, provides insights for recognizing when these techniques might be being used on yourself. Good point, Barb. We are often so intent on getting good information from others that we forget when someone is querying us, just as purposefully.